Today, the Milan Rho Fair witnessed the announcement of the six projects winning the industrial design contest, this year focusing on the themes of smart chair and fiscal printer. Within the setting of the events staged at Milan Rho Fair for the opening of the Milan Furniture Show and Milan Design Week, awards were attributed to the projects winning the third edition of the Olivetti Design Contest. This Olivetti initiative - today digital hub of the TIM Group – attracts students from the most important universities in the sector at international level. Twenty-one the projects reaching the finals, involving over 50 students in the endeavour tooffer an original contribution to the creation of a Smart Chair and Fiscal Printer. for the Fiscal Printer, first prize (value €2,000) awarded to “Cochlea” by Margherita Belli, Nunzia Campana, Davide Conti and Gaia Gradilone, of RUFA; second prize (€1,500) to the project “Fiscal Printer” by Alessandro Belotti and Paolo Cavagna of IED Milan; third prize (€1,000) to the project “Orca” by Giulia Mosca, Claudia Guagnano, Lara Di Benedetto and Giulietta Baldini of RUFA. Two on-the-job training courses will be organised at the Claudio Bellini Design+Design studio for the first prize winners of each project category. 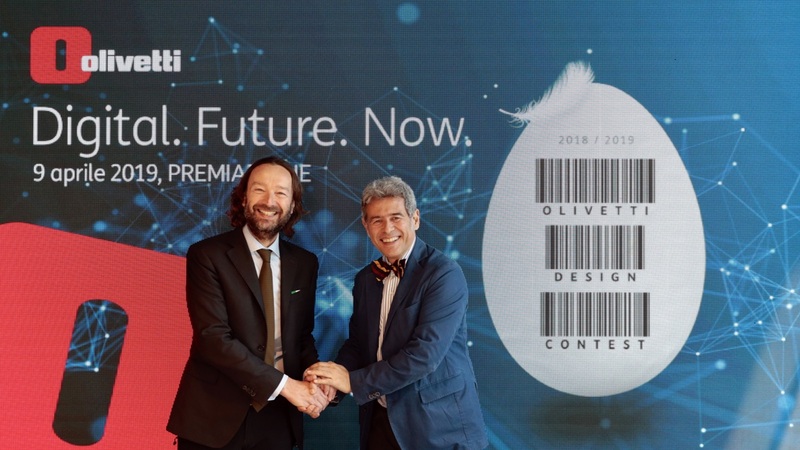 «We were astounded by the quality of the works submitted and are convinced that the talents winning the Olivetti Design Contest will provide a concrete contribution towards the future evolution of the sales point and work environments generally», declared Pierantonio Macola, Presidente of Smau. «The high level of the projects examined confirms the capacity of Olivetti to attract talented people capable of generating original ideas in synchrony with the company’s history of innovation, creativity and design - all in the right setting of the Milan Design Week currently underway»,affirms Ettore Spigno, Olivetti CEO.